We recognise that seclusion room doorsets are different to others. They need to withstand high levels of aggression, for extended periods of time. Protruding items such as a handle, hinge or vision panel beading have all been removed from the inside of the door. So there are no protrusions which could be used to self-harm – protecting service users when they’re most vulnerable. 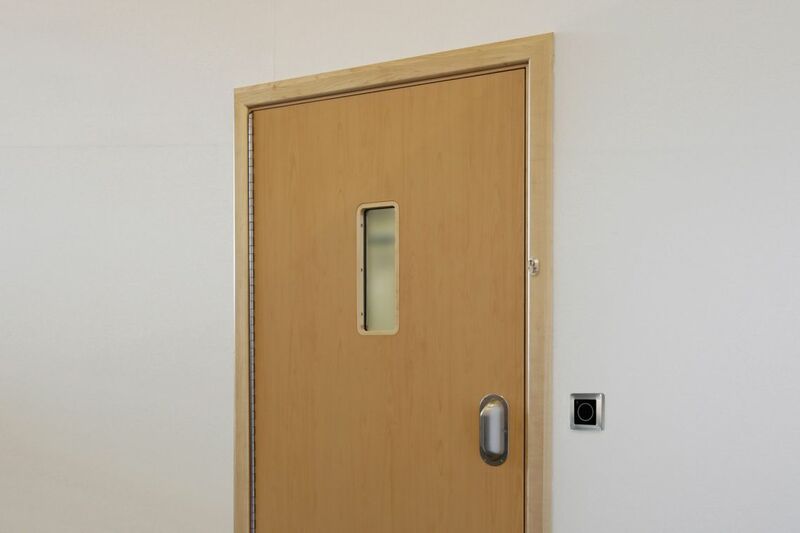 The solid hardwood door core meets recommendations from the National Association of Psychiatric Intensive Care Unit (NAPICU). 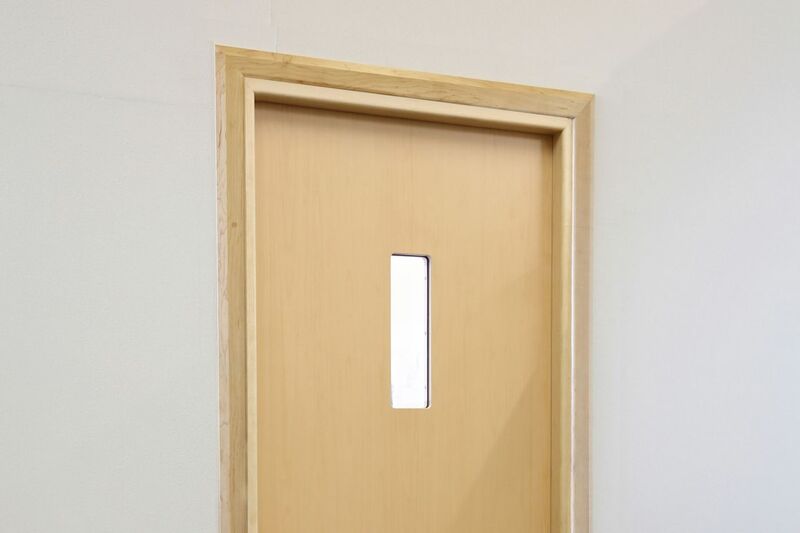 As the most durable in high-abuse environments, PVC door facings are used as standard. Has the door been abuse tested? We've rigorosly abuse tested our seclusion room doorset to ensure it's robust for extreme abuse. We initially tested geared aluminium hinges, but instead chose a robust continuous stainless steel option as it can withstand both the door’s weight and the potential abuse. Our PVC facing's are available in both timber effect and colour finishes, to complement your designs.Timber effect, in particular, can help create a more calming space and aid de-escalation. 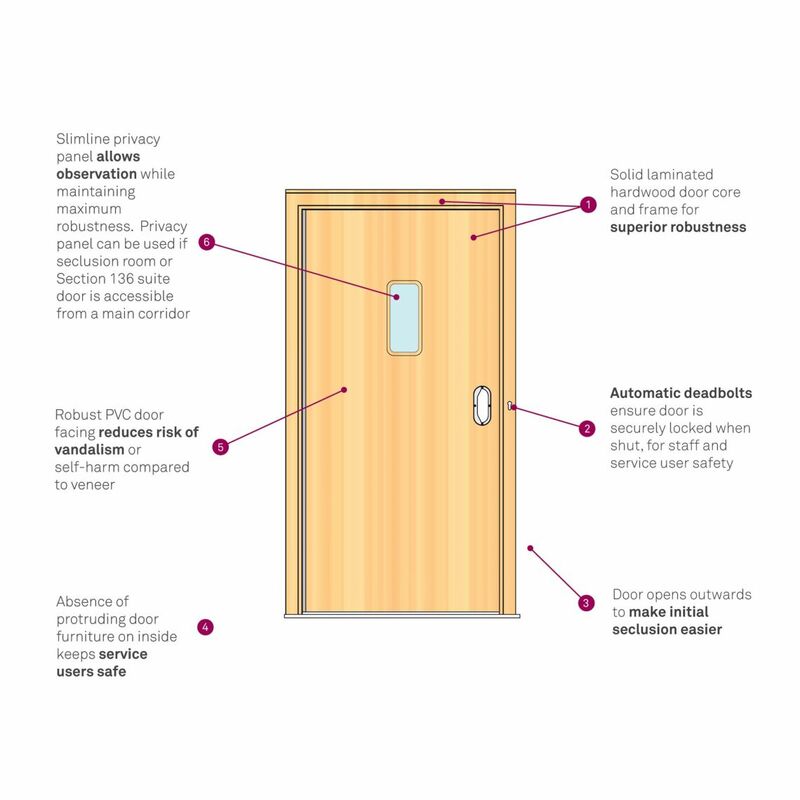 The seclusion door has no protusions on the service user side – minimising the risk of self-harm when at their most vulnerable. That's just one lifesaving detail of our durable seclusion room doorset. Ask us about the others. other doors in the ward. And for complete peace of mind, there’s a mechanical override, so the lock will fail secure and still allowing you to unlock the door if there’s no power. Available in a 1- or 3-point lock arrangement. Designed for scenarios requiring a high level of security and robustness, but without electronic locking. The 2-point mechanical lock has two self-locking bolts which are operated from a single keyway, making it practical.